One often overlooked issue following a separation or divorce is how a former couple’s federal income taxes should be filed. Many people who are going through a California divorce have tax questions about filing status, community property, dependent exemptions, alimony, child support, and legal fees. Although every former couple’s situation is different, some commonly asked questions are answered below. First, an individual who is going through a divorce must determine his or her proper filing status. No matter when a former couple’s petition for divorce was filed, the couple is considered married for federal income tax purposes if a final decree of divorce was not issued before the year ended. Next, a former couple who is still married for tax purposes must decide whether to file jointly or separately. Normally, a former couple’s tax burden will be lower if they file jointly. One benefit of filing separately, however, is that each individual is liable only for his or her own individual share of the tax burden. This distinction may be important for an individual who foresees a problem with obtaining proper payment for a former spouse’s share of the tax bill. If a former couple is considered unmarried for tax purposes, each individual will normally file as single. Where a qualifying child lives in the home, a head of household status may also be used. By filing as head of household, a parent’s income tax burden will usually be lessened. Because California is a community property state, any income earned by either spouse during a marriage normally belongs to both partners. If a former couple is not married and filing jointly, each member of the couple must claim one-half of all community income on their individual tax return. Any property owned prior to the marriage or inherited as an individual is considered separate property. Separate property income should always be claimed solely by the former spouse it belongs to. Additionally, any alimony payments must be claimed as income by the payee and may be deducted by the payer. Child support payments, however, are neither deductible nor taxable. Normally, which parent may claim a former couple’s children as dependents for federal income tax purposes will be determined in the divorce decree. Oftentimes, parents will elect to allocate the tax credit to the parent who will most benefit from the exemption. If a non-custodial parent claims any children from the marriage as a dependent for income tax purposes, the custodial parent must agree in writing by filing an Internal Revenue Service form 8332. Finally, it is important to note that any legal fees associated with marriage dissolution may not be deducted. Still, any portion of an individual’s legal services that were used to determine their overall tax liability may be included as an itemized deduction. If you have questions, it is a good idea to ask your divorce attorney to provide you with a detailed list of tax-related legal fees. 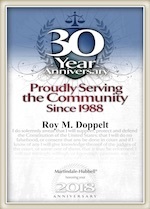 If you have divorce or other family law questions, you should contact Doppelt and Forney, APLC . Mr. Doppelt is a knowledgeable San Diego family law attorney who has more than 20 years of experience guiding clients through the legal separation and divorce process in California. Mr. Doppelt is available to assist you with all of your divorce, child custody, child support, alimony, adoption, and other family law needs. Doppelt and Forney, APLC serves clients in Linda Vista, Scripps Ranch, San Diego, Encinitas, and throughout Southern California. To schedule a free confidential consultation with a hardworking family law attorney, do not hesitate to call Doppelt and Forney, APLC toll-free at (800) ROY IS IT (769-4748) or contact us through the law firm’s website.